As those interested in trains know, railroads are primarily "background" in the United States. Only when an individual is halted at a crossing by a slow train, or there is a derailment that causes impact on a community -- both negative events -- does the average citizen even consider the presence of railroads in their towns or cities. 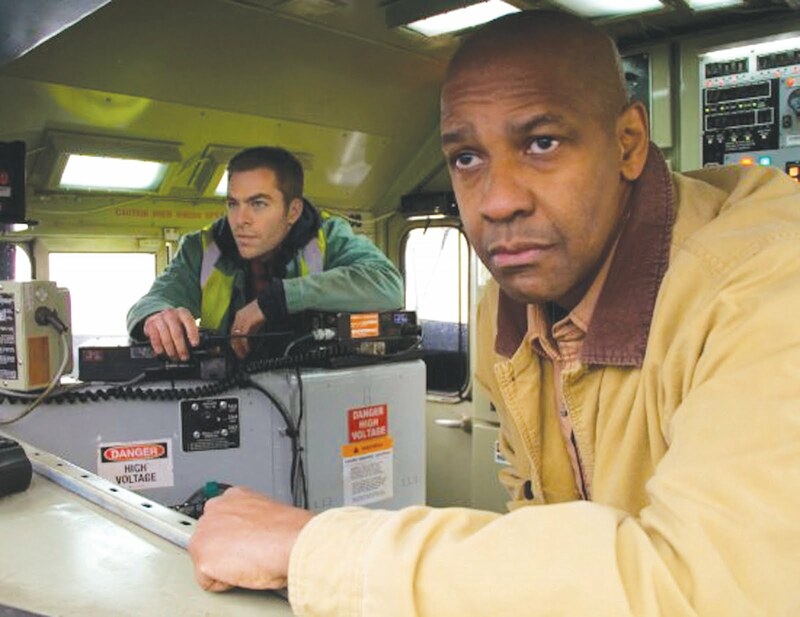 In that vein, there aren't many movies produced by Hollywood in which trains have something of a starring role. Two come immediately to my mind: "Runaway Train" with Jon Voight and Eric Roberts (1985), and the ever-classic "The Train" with Burt Lancaster (1964). 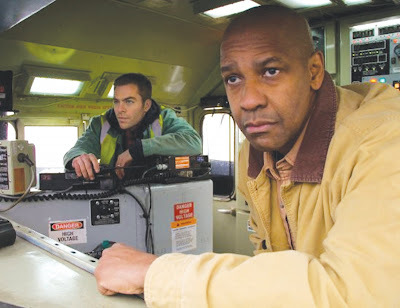 Move over; there is another train film in town in which a newer General Electric locomotive -- and an older EMD as well -- shares stardom with Denzel Washington and Chris Pine (Star Trek, 2009). The film was inspired by this incident. And, if you as a railroad enthusiast can overlook the obvious technical faults, it's an excellent film showcasing great acting, great pacing and non-stop action. Bottom line, even if you're not a rail or locomotive enthusiast? An exciting action movie well worth your money for the big screen. But of course, being the equivalent of the pejorative "foamer," I cannot stop the review here. I have to be the one to point out a few such aforementioned technical faults. 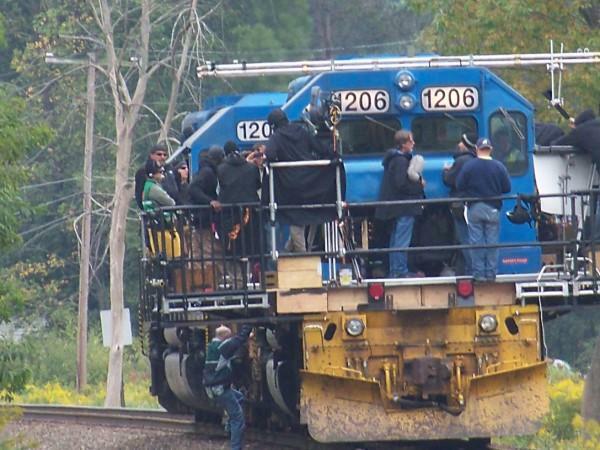 The film begins with a yard's hostler instructed to move his train in order to clear it for another. 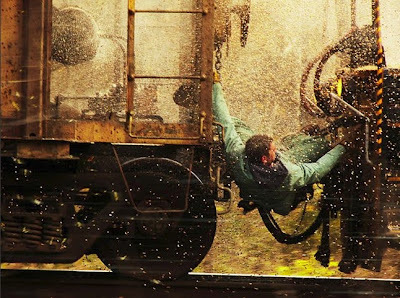 In the process he fails to connect the glad-hands from the locomotive set to the rest of the train (good overview of train air brakes here). 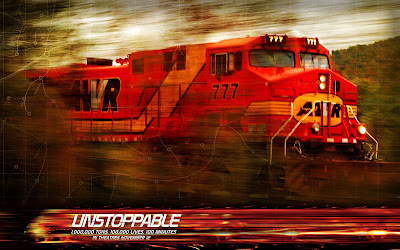 His failure to make this connection helps, in part, to allow the train to move from a simple "coaster" to a full-on runaway (see BNSF Air Brake & Train Handling Rules -- 120 pages -- here). Further, he has placed the reverser into the forward position and added throttle (it appears to be Run 1 if I recall). He decides to physically exit the cab in order to throw a yard switch ahead of the consist but fails to reach the switch in time. He also fails to regain the locomotive as it starts to pick up speed and leaves him on the ground. Ooops. Cut to a close up of, magically, mystically, the throttle somehow swiping itself fully into Run 8 -- the highest throttle setting available in current diesel-electric locomotives. Even if the train were to somehow be on the move, the Alerter system would stop the locomotive consist which, in turn, would slowly stop the runaway. Look at my cab photo below. In this framing you can see the Alerter button is circled. After a period of time in which no input has been made by the engineer to any control, a loud alert begins to sound. It becomes progressively louder if the engineer does not carefully push the reset button. In truth, because they are so annoying, the engineers customarily mash the reset button with all the aplomb and care usually reserved for sledgehammers. 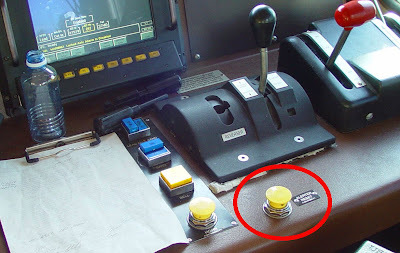 If the Alerter is not reset, the locomotive and any attached locomotives would be thrown into the equivalent of "emergency" and the locomotive brakes would be applied immediately. Because the air had not been connected to the rest of the train, the locomotive "independent" brakes would apply. The train would be stopped, but not as quickly as if the rest of the brake pipes on the trailing cars were connected. Absent these and a few more tidbits, the movie is thoroughly enjoyable. As always, comments or questions? An EMD SD40-2 rigged for filming, painted in fictional "Allegheny & West Virginia" colors. Point "star" is former Canadian Pacific GE AC4400CW #9782, built in 2003, rated 4,400 hp.